A week ago a consumer found my company on Avaliving, a site where designers help consumers resolving their design challenges with brief suggestions. Based on the suggestions received, consumers have a faculty to hire a particular designer through Avaliving’s program. We work through photographs that consumers send to us, description of the existent situation of the room to discuss and description of their desires and needs. The challenge of this particular customer was to find a better solution for the master bedroom, a rectangular room looking over a lake. Looking at the pictures I received from the consumer, I realized the feet of the bed were pointing at the entrance doors. That is not a good thing to do in any culture of this world. The energy of the bedroom will become a really bad one when pointing feet at the entry. Even a person without any Feng Shui knowledge would know that. My suggestion was to set the bed in a diagonal in the corner of the room facing the French door to get more enjoyment out of the view of the lake. Setting a bed in the corner has the disadvantage of taking up lot of the space in the room, but there are other benefits in return, one being looking at a beautiful view for instance, if there is one. Another advantage is to free the spaces on both side of the bed and instead of having two night stands in the traditional way, there is an opportunity to create a short and interesting built-in unit behind the bed, made in a beautiful wood species hosting lighting for reading, music speakers, plants or flowers, photographs, accessories and candles, or it would be just a place where to rest keys, small changes and cellular phones. One other way to decorate a bed that has been set in diagonal in one corner of the room is to fill the background with a beautiful overhanging canopy in sheer fabrics, tall plants and a game of lighting coming from behind the bed. If there is no view to enjoy, create a fireplace. There is nothing more suiting than the crackling of the fire, while reading a book, or conversing with the partner. Make sure under the bed there is no storage hiding to allow the flow of positive energy through the room and under the bed. At the feet of the bed, it would be appropriate to set a bench where to leave a purse or some clothes of the day. In different times there used to be a trunk at the feet of the bed with lot of the owner’s possession inside, gold, clothes, money and valuable housewares, always ready to go. Some people still do it today. 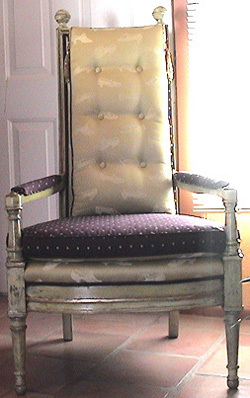 One or two slipper chairs were also furniture used at the feet of the bed, especially in women’s boudoir. The slipper chair with a very straight back and a small seat was created to slip shoes on and off, not to sit on for a long time. The ample and clumsy women dresses required very comfortable chairs to sit on like the “fauteuil” , “bergere” and “recamier”. Being the contrarian that I am, I never will suggest to take T.V. out of the bedroom. T.V. is a window to the world, watching the “tele” in bed in the arms of the partner is a good thing. It makes two people come together at the end of a working day and it is good for conversation, whether sharing laughter while watching a comic film, or political comments. Oh, by the way, having problems falling asleep sometimes? Turn the tele on something not too engaging, set the T.V. timer and in fifteen minutes you will be sleeping, guaranteed! T.V. lowers the metabolism and puts you in a state of relaxation. Many designers suggest that the bedroom should be luxurious like a hotel; a sanctuary like a chapel, silent, evocative, spiritual and T.V. don’t belong in bedrooms. Hotels have a T.V. right across from the bed, why should we not have it in our bedroom? Come on! People are human and real people like to do things humans do. Watching T.V. in bed is one of them. The important thing to remember is to conceal the T.V. in a cabinet to keep the electromagnetism in there. I agree with all the designers that a working space does not belong in the bedroom and if there is a home office there, make sure by nighttime is completely closed and off-limits. I am glad you liked it. Thanks for reading me.